Looking for a hands-off approach to investing or a free stock market trading app? Betterment and Robinhood are leaders in the robo-advisor and free online trading fields respectively. If you’re uncertain where to invest your money, this Betterment vs Robinhood review compares fees, investment minimums, tax strategy, and more to help you decide which service best matches your financial needs. Which is best? That boils down largely to whether you want an advisor to manage money for you and how much control you want over your portfolio. 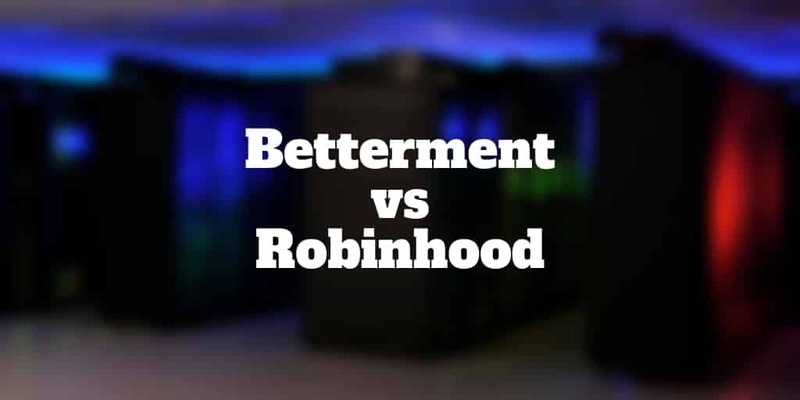 Which Robo-Advisor Is Best For You: Robinhood or Betterment? Betterment has two levels of service: a basic robo-advisor (Betterment Digital) and a robo-advisor with access to unlimited human advice (Betterment Premium). Investors who want their portfolios managed are best suited to Betterment, which features behavioral finance methods to support goal-setting and encourages more rational decision-making. To ensure clients remain fully invested at all times, Betterment caters to the purchase of fractional shares. Betterment also offers an automated charitable giving service and socially responsible portfolios to allow clients align their investments with their values by allocating money to social-driven causes. Robinhood simply cannot be beaten on price. Commission-free stock, ETF, and cryptocurrency trading is available through its mobile app. The interface is highly intuitive so beginners and experienced investors alike will be able to navigate seamlessly. You might be wondering if the Robinhood mobile app is free and commissions are zero, how does Robinhood make money? One income stream is from Robinhood Gold, a service tier that enables users to borrow money to invest (also called margin trading). A flat monthly rate is charged to boost customers’ “buying power” as Robinhood calls it. Robinhood Gold is aimed at risk-seeking investors who want to goose returns. Beware when borrowing to invest that risks when trading on margin are magnified. Betterment Digital is primarily a robo-advisor service run by computer algorithms that allocate money based on client risk profiles and goals. It also includes limited access to financial experts who can advise clients, as well as in-app messaging on-the-go. The 0.25% annual management fee for Betterment Digital is at the low end of the spectrum of rivals’ fees and on a par with Ellevest and other leading robo-advisors. Betterment Premium costs clients 0.40% annually on managed assets. For the extra fees, clients receive unlimited phone and email access to financial consultants, as well as in-app messaging. No commissions and no fees at Robinhood. Surely there’s a catch? Nope! What makes Robinhood so special is it actually delivers on its promise of no fees and no commissions. When you sign up you won’t be surprised by hidden fees that crop up out of nowhere, they simply do not exist. Only users who wish to borrow money using Robinhood Gold will need to pay to trade on margin but that is to be expected. Investormint Verdict: You can’t beat free! Robinhood wins hands-down on cost. No investment minimum is required to sign up to Betterment Digital, however a steep $100,000 minimum is in place to get started at Betterment Premium. The Robinhood account minimum is zero for basic service but traders who want access to Robinhood Gold will need to deposit at least $2,000. Investormint Verdict: Robinhood and Betterment are tied when it comes to account minimums for basic service. Daily tax-loss harvesting on all taxable accounts and tax-coordinated portfolios are two primary tax strategies. Tax-loss harvesting is a system of selling losing positions to offset capital gains taxes. Tax-coordinated portfolios place tax-efficient funds in taxable accounts and tax-inefficient funds in tax-advantaged retirement accounts. According to Betterment, performance returns on average are as much as 2.66% higher as a result of its tax strategies. Robinhood caters to individual taxable accounts only. For investors with IRA or Roth IRA accounts, Betterment is the better choice while blooom is best for automated management of 401(k) accounts. Investormint Verdict: Betterment comes out well ahead of Robinhood on tax strategy. Investormint Verdict: Betterment offers a wide variety of account types whereas Robinhood only features individual taxable accounts. Betterment spreads money across as many as twelve asset classes to ensure portfolios are fully diversified. Digital users have no control over the allocation percentages however Premium users can modify amounts. Robinhood offers stocks, exchange-traded funds, and cryptocurrencies. The responsibility is on traders to make investment decisions. Investormint Verdict: Betterment manages portfolios on behalf of users and adheres to strict rules of diversification. Robinhood users pick their own positions so performance returns may vary more widely. ✅ Fees & Commissions: Nothing beats free! Robinhood’s no-commissions policy easily beats the competition. ✅ Hands-Off Management: Investors who prefer to hand over portfolio management to a financial advisor should look to Betterment over Robinhood. ✅ Investment Minimum: While neither Betterment nor Robinhood impose minimums for basic service, the six-figure minimum for Betterment Premium gives Robinhood the victory. ✅ Tax Strategy: Each day Betterment checks to see if tax savings opportunities exist and offers two strategies to keep more money in your pocket and less in Uncle Sam’s. ✅ Active Investors: Investors who want control over their portfolio selections will fare best at Robinhood. ✅ Account Selection: A wide variety of accounts are offered including taxable, retirement, and trust. ✅ Cryptocurrencies: Between the two services, only Robinhood offers cryptocurrency trading. ✅ Tools & Services: Retirement tools, charitable giving services, socially responsible portfolios, and more are all available to all users. The decision to choose Betterment or Robinhood is largely a question of preferences. If you like to control your own portfolio selections then Robinhood is ideal. For hands-off investors, Betterment can place your portfolio on auto-pilot. On cost, nothing beats Robinhood. It simply cannot be beaten thanks to its commission-free and no hidden fees policies. Betterment is best for investors who care about after-tax returns or have more complicated financial situations requiring numerous types of accounts, whether taxable, retirement or trust. The bottom line is Betterment and Robinhood offer two very different services. Investors who want the comfort of oversight and long-term planning should look first to Betterment while Robinhood is a low cost service for DIY traders.